PROF. JAMES W. WATTS: Leviticus’ Rhetorical Presentation of the Sin and Guilt Offerings (TheTorah.com). The transition from the chatat (חטאת) sin offering in Leviticus 4 to the asham (אשׁם) guilt offering in Leviticus 5 is sudden, even seeming to collapse them into one offering. The history of these offerings, when and why they were introduced into the Temple service, sheds light on the interpretation and structure of these chapters. BYRN MAYR CLASSICAL REVIEW: Robert J. Bull, The Mithraeum at Caesarea Maritima, vol. II. American Schools of Oriental Research archeological reports, 25. Bristol: American Schools of Oriental Research, 2017. Pp. xiii, 100. ISBN 9780897570978. $74.95. Reviewed by Kevin Stoba, University of Liverpool (k.stoba@liverpool.ac.uk). For a recent photo essay on the Mithraeum at Caesarea, see here. At the Brill website, but, alas, requires a paid personal or institutional subscription to access. But I'm pretty sure you can see the abstracts without one. HT Dylan Burns at the NSEA Blog. In Greek Writers and Philosophers in Philo and Josephus Erkki Koskenniemi investigates how two Jewish writers, Philo and Josephus, quoted, mentioned and referred to Greek writers and philosophers. He asks what this tells us about their Greek education, their contacts with Classical culture in general, and about the societies in which Philo and Josephus lived. Although Philo in Alexandria and Josephus in Jerusalem both had the possibility to acquire a thorough knowledge of Greek language and culture, they show very different attitudes. Philo, who was probably admitted to the gymnasium, often and enthusiastically refers to Greek poets and philosophers. Josephus on the other hand rarely quotes from their works, giving evidence of a more traditionalistic tendencies among Jewish nobility in Jerusalem. EXHIBITION: See Ancient Trade Route Treasures at the Met. “The World Between Empires,” linking present and past, celebrates the distinctive art from all the cultures of the Middle East (Holland Cotter, New York Times). The article has good photos of many of the remarkable objects in the exhibition. Looks well worth a visit. KARAITE-AND-CABLE-CAR-CONFLICT WATCH: Internationally renowned architects add opposition to Jerusalem cable car plan. Ron Arad, Moshe Safdie, Santiago Calatrava among 27 figures charging that ‘powerful interest groups’ are putting tourism and politics above safeguarding cultural treasures (Sue Surkes, Times of Israel). The article only mentions the opposition to the cable car plan by the local Karaite community at the very end. But more on that here. BELIEFNET: Biblical Translations We Keep Screwing Up. You keep using that word. It does not mean what you think it means (Stephanie Hertzenberg). Two comments. First the section on the word Asherah is correct that it means more than just a "sacred pole" and that it is associated with the Canaanite goddess Asherah. But the Hebrew word is used with the definite article, which means it refers to an object rather than directly to the goddess herself. (Personal names cannot take definite articles.) So perhaps translate "Asherah's sacred pole" or some such? For many past posts on Asherah and the asherah, see here and here and links. Second, "Lo Tirtsah does mean "you shall not murder" in certain contexts, but the range meaning is wider than that. It also refers to when someone accidentally kills someone else (which we call "manslaughter"). The verb means something like "to kill without provocation" or "to kill in cold blood." Additional details are here. Opening Jerusalem's Nea Church to the public? PETITIONED BY EMEK SHAVEH: Decades after discovery, Jerusalem’s Byzantine masterpiece may open to public (Ilan Ben Zion, Al-Monitor). The article reports that the Nea Church was founded by the Emperor Justinian in the sixth century. It was excavated in the 1970s by Nahman Avigad, but most of its subterranean vaults still remain closed to the public. But Daniel Shukrun, secretary of the Company for the Reconstruction and Development of the Jewish Quarter, told Al-Monitor that the Nea Church vaults are presently unsafe for the general public. In late 2017, the company conducted a major clean-up operation inside the subterranean chambers to clear out years of accumulated bat droppings and refuse, but the area remains unsuitable for tourists, he said. “The sanitation problems were so severe down there that we couldn’t even understand what we were up against,” he added. Nonetheless, Shukrun said that in light of Emek Shaveh’s petition, the company has gotten the ball rolling on evaluating a development plan for the Nea Church ruins. But he says that it would cost a lot of money. EPIGRAPHY: Archaeological Excavations Reveal 1700 Year-Old Inscription of City Named ‘Elusa’ (Halutza) in the Negev (Jewish Press News Desk). The name of the city of Elusa appears in a number of historical documents and contexts, including the Madaba mosaic map, the Nessana papyri and other historical references. However, this is the first time that the name of the city has been discovered in the site itself. The inscription mentions several Caesars of the tetrarchy which allow to date it around 300 CE. According to the Jerusalem Post, Halutza is also one of two possible sites for the biblical city of Ziklag. BIBLE HISTORY DAILY: Origins: 3.14159265… Why did the ancients invent increasingly subtle and ingenious methods to arrive at an exact value of pi? Human curiosity (Kim Jonas). For more on Pi Day and Pi and Judaism, see here and here and links. THE BOOK OF DOCTRINES AND OPINIONS BLOG: Eitan Fishbane on The Art of Mystical Narrative: A Poetics of the Zohar. I noted a panel discussion on the book here. And for many, many past posts on the Zohar, start there and follow the links. Cross-file under Zohar Watch. THE COPTIC MAGICAL PAPYRI BLOG: Religion in the Coptic Magical Papyri IX: Judaism and Coptic Magic (Korshi Dosoo). A wide-ranging post that starts with background on the history of Judaism in Egypt and goes on to specific magical traditions and texts, including a new Coptic magical papyrus involving Solomon. I have noted the previous posts in the series here and here. DR. SARIT KATTAN GRIBETZ: Shabbat with Food: From Biblical Prohibitions to Rabbinic Feasts (TheTorah.com). Biblical prohibitions against preparing food on Shabbat are further developed in the Second Temple and rabbinic periods. At the same time, a new emphasis emerges: celebrating Shabbat with festive meals. THE HOLY LAND PHOTOS' BLOG: Rome — Temple of Peace and a Map of Ancient Rome. Carl Rasmussen gives some further background on the Roman temple where the treasures of the Jerusalem Temple were kept after the Great Revolt of 70 C.E. Background here and here, with Part 3 still to come. PURIM IS COMING: The Romans tried to ban wild Purim parties in 408 CE – for a very good reason (Henry Abramson, JTA). The issue seems to have arisen over a misunderstanding of the biblical account of Haman's death. UPDATE (19 March): I see I noted another story on this topic here. APPREHENDED: Turkish police seize ancient manuscript stolen from Syrian museum (Anadolu Agency/Hurriyet Daily News). The Turkish authorities continue to round up fake ancient artifacts before they reach the antiquities market. This codex bears the hallmarks of a crude modern fake. Most importantly, the writing on the page shown in the photo consists of lines of meaningless sequences of Hebrew letters with frequent repetition. There are other suspicious features. The letters are written in gold leaf. The material and cut of the pages is similar to other fakes. There is a drawing, in this case of a wyvern-like creature. The drawing doesn't look very old to me, but I'm not an art historian. The police also recovered (from the car of the suspects) a gun that fires blanks. Metaphor Watch? The information that the book was stolen from a Syrian museum comes from the apprehended suspects, who may not be very reliable sources for provenance information. It would not surprise me, though, if it did come from Syria. Many such artifacts have been apprehended recently in Turkey. The only ones I think are likely to be genuine are some coins. For past apprehensions, start here and keep following the links back. And this post on recent Hebrew forgeries from Arab countries seems relevant too. BIBLE HISTORY DAILY reposted some posts on women in the New Testament and the New Testament Apocrypha, leading up to International Women's Day, which was last Friday. Some past PaleoJudaica posts on Thecla are here and links and here. For more on Tabitha and Lydia follow the links for posts by Phil Long in his series on the Book of Acts at his Reading Acts Blog. NUMISMATICS: CoinWeek Ancient Coin Series – The Seleucids and Their Coins: Part III (Mike Markowitz, Coin Week). The Hebrew Bible does not mention any of these Seleucid kings. But all of those covered in this installment appear in 1 Maccabees and some also in 2 Maccabees. I noted Part I of this series here. Also there, see a link for more on the Seleucids. And I noted part Part II here. Young and Rezetko’s whole discourse is oriented to the outcome, dictated from the start, that there is no historical linguistics of ancient Hebrew. This is a disingenuous procedure that makes for flawed philology. See Also: Can the Ages of Biblical Literature be Discerned Without Literary Analysis? Background here. For other posts on the book that was under review (Hendel and Joosten, How Old is the Hebrew Bible? ), follow the links there (cf. here). THE WORLD IS FULL OF HISTORY: Who Was the Real King Herod? (Owen Jarus, Live Science). An excellent capsule history of the life of Herod the Great. The subheading "Did he kill Jesus?" is odd, because it doesn't fit the contents of what follows. Perhaps it should have read "Did he try to kill Jesus?" For many past posts on Herod the Great, start here and just follow those links. 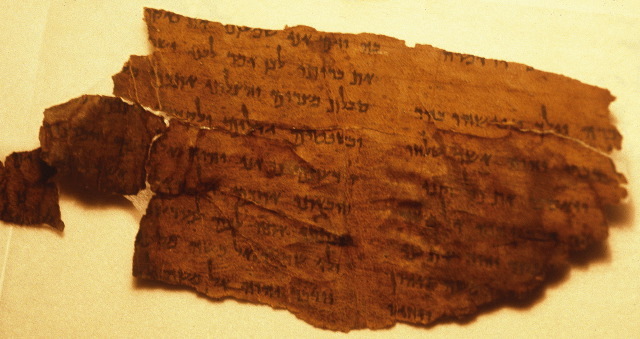 ON THE SUBJECT OF TREASURE AGAIN: The Lost Treasure of the Dead Sea Copper Scroll (Joanna Gillan, Ancient Origins). As I have noted before, the quality of the essays in Ancient Origins is variable. This one is pretty good. It gives an accurate account of the discovery of the Copper Scroll, its contents, and some possible explanations of its contents. The essay could have added that one interpretation reads the amounts of treasure to be much smaller — and therefore more believable — than the traditional interpretation. The essay concludes with the current efforts of one Jim Barfield to find the Copper Scroll treasures. I have commented on that here and links. For reasons explained there, I do not find Mr. Barfield's claims to be credible. For many other past posts on the Copper Scroll, start here and follow the links. ANCIENT JEW REVIEW: Dissertation Spotlight | Story and Sacrifice: Ritual, Narrative, and the Priestly Source. With these questions in mind, my dissertation centered on the eight-day tabernacle inauguration episode in Exodus 40 through Numbers 8, with an eye to two interrelated issues: 1) the question of the relationship between ritual and narrative in pentateuchal literature, and 2) the issue of identifying stratification within a narrative text. This second issue prompted the development of a new narratologically-based approach for the analysis of composite narrative texts that I use throughout the dissertation, and which, I argue, would prove fruitful for the study of the Hebrew Bible and Pentateuch more generally. AJAM MEDIA COLLECTIVE: A Jewish Shrine inside a Mosque: the History of Ezekiel’s Tomb in Iraq (Alex Shams). An impressive, comprehensive history of the (traditional) Tomb of Ezekiel in Al-Kifl, Iraq, with many excellent photographs. It includes an update on the restoration work, which was noted here in 2010. According to the article, the "compromise" involved erasing Hebrew inscriptions from the mosque section, which does not sound very satisfactory to me. I have been following the fate of the (traditional) Tomb of Ezekiel for many years. For other past posts, start here and follow the links. VIDEO: The Dead Sea Scrolls 70 Years On. A lecture by Professor Hindy Najman posted by Chabad at Oxford. WILLIAM ROSS: 2019 ETS SEPTUAGINT STUDIES CALL FOR PAPERS. The deadline for proposals is 29 March 2019. THE HOLY LAND PHOTOS' BLOG: A.D. 70 The Destruction of the Temple — Where did the Temple Treasure Go? Part 2. In this installment, Carl Rasmussen tells us the fate of the Temple treasures in Rome. But for what happened to them after that, we have wait for Part 3. Meanwhile, for Part 1 and additional coverage of the question, see here and links. THE EGYPT EXPLORATION SOCIETY: Unpublished EES biblical papyri. In brief, among the unpublished papyrus fragments from Oxyrhynchus, there are 20 New Testament fragments, 80 Septuagint (i.e., Greek Old Testament) fragments, and 10 patristic fragments. Follow the link for a few more details. I hope they publish a more detailed list of which books the fragments come from. Also, I wonder if they are aware of any unpublished fragments of Old Testament pseudepigrapha? The most recent volume included some of Jannes and Jambres. HT Brent Nongbri at Variant Readings. PUNIC WATCH: Who was Hannibal? Sworn by his father to forever hate the Romans, Hannibal staged one of the most legendary attacks in the history of military warfare on the formidable army (National Geographic). Because you should know these things. For past posts on Hannibal and his remarkably military campaign against Rome, see here and links. If Hannibal's luck had been a little better, the learned language of medieval Europe would have been Punic instead of Latin. This handbook situates early Christian meals in their broader context, with a focus on the core topics that aid understanding of Greco-Roman meal practice, and how this relates to Christian origins. In addition to looking at the broader Hellenistic context, the contributors explain the unique nature of Christian meals, and what they reveal about early Christian communities and the development of Christian identity. Beginning with Hellenistic documents and authors before moving on to the New Testament material itself, according to genre - Gospels, Acts, Letters, Apocalyptic Literature - the handbook culminates with a section on the wider resources that describe daily life in the period, such as medical documents and inscriptions. The literary, historical, theological and philosophical aspects of these resources are also considered, including such aspects as the role of gender during meals; issues of monotheism and polytheism that arise from the structure of the meal; how sacrifice is understood in different meal practices; power dynamics during the meal and issues of inclusion and exclusion at meals. There is also a lot of discussion of meals in ancient Jewish contexts.